Roof damage from trees is increasingly becoming problem strongly related to roofing in Newnan. Stormy weather marked by heavy winds and hailstones increase the probability of a tree falling on the roof of the house. Identifying such damages can be challenging. You may think that a particular leak in the roof is due to water damage, but the truth is that part of the tree that fall on the roof during a stormy weather is the actual cause. In this post, we are going to highlight common types of roof damage cause by trees. If your roof is barely five years old,and you begin to notice scarred singles on it, you need to be alarmed. 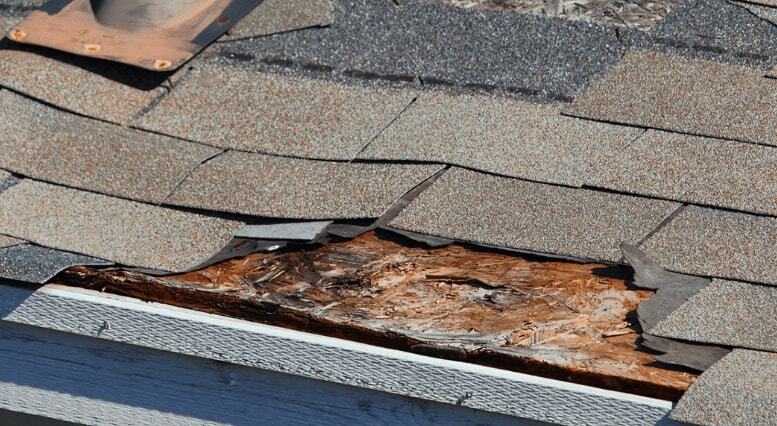 In other scenarios, the shingles are badly damaged to an extent where some parts are missing. Damaged and scarred shingles can be due to a particular tree branch that is in contact with the roof. During windy conditions, the tree branch brushes over the roof. Over time, the constant brushing produces friction between the branch and the roof, which leads to damage and scarring of the shingles. Cracked and broken tiles in a roof are a common problem that most homeowners encounter. However, the problem is more prevalent in homesteads that have a lot of tall trees covering the whole compound. This is because tree branches overlying the roof tend to break occasionally and fall on over the roof tiles. In most cases, the tiles cannot withstand the strong impact created by the falling branches because they are brittle. As a result, they will crack and even break. Broken tiles in homes surrounded by tall trees are more common during stormy weather. This is a prevalent problem in Newnan, GA because people in this community love trees. Most homeowners hate trees because of this problem. Tall trees tend to drop leaves on the roof regularly. The problem is more common during spring, especially when there are heavy winds. Leaves on the roof not only make it look ugly but can also reduce the resale value of your home, which is a nightmare for real estate agents. Over time, the leaves on the roof start to decay. When combined with moisture, the rotten leaves encourage growth of algae and fungal plants on the roof. This might accelerate the rate at which the roof ages. The retained moisture on the leaves may also infiltrate the tiles and shingles and leak to the ceiling. When you notice the roof no longer has shingles, it is due to tree damage or hailstones. A falling tree or its branch will chip off the shingles from the roof. You may notice signs of roof damage from the ground when you begin to see shingles on the ground. That is why it is important to inspect your landscape, especially after a storm, to look for warning signs of roof damage caused by fallen tree and branches. You may also notice large dents on the roof or the gutters. Though it is a classic sign of hailstones, falling trees and branches can also cause the problem. It is very tempting to climb the roof to remove the fallen tree or cut down the tree on your own. However, you need to deviate from these tendencies because they are potential dangers that come with them. If you see a tree within the proximity of your house that is potentially harmful to your roof, contact a professional to help you remove it. If the roof needs any kind of repair, contact Eagle Watch Roofing, a local roofing Newnan, GA professional for help.